Moto Z3 Play announced with 6-inch FHD Super AMOLED display, 4GB RAM and Moto Mods. 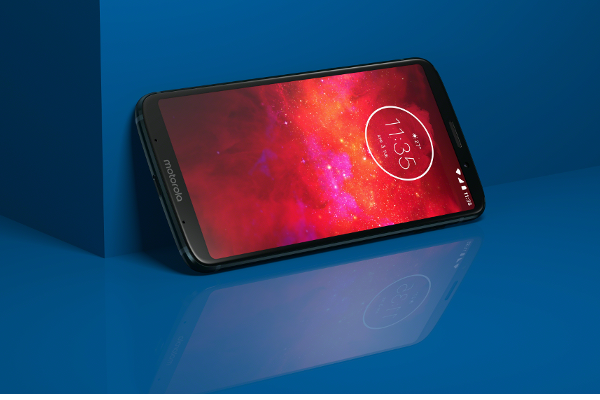 Lenovo-owned Motorola today announced the launch of a new premium smartphone called Moto Z3 Play. It continues the Moto Z legacy adding next level edge-to-edge display and puts AI at your fingertips with dual depth-sensing smart cameras and smarter contextual computing. The best part about Moto Z3 Play is it will get better with time as new Moto Mods become available and AI and Moto Experiences get richer. The 6" Full HD Super AMOLED display on the Moto Z3 Play gives you edge-to-edge views with 13 percent more screen area and more pixels per inch than the last generation within the same device dimensions. It's made entirely from Corning Gorilla Glass and lightweight, aircraft-grade aluminum for strength. The fingerprint sensor is mounted on the side to declutter the screen and it comes with a simple gesture-based One Button Nav bar at the bottom further improving the usability of a large screen. The Moto Z3 Play is powered by a Qualcomm Snapdragon 636 processor. Always chatting with Google Assistant? Moto Z3 Play excels at voice interaction. Featuring four microphones and low power natural language processing, moto z3 play will pick up your voice even when you're not holding your phone or in a noisy environment. The Moto Z3 Play provides faster performance and AI assisted interactions so you can be more productive on your smartphone. You can capture brilliant, sharp photos even on cloudy days or indoors with dual 12MP and 5MP AI-powered cameras, a first for Moto Z3 Play. Get creative with the depth-sensing AI camera's new photo features, including Cinemagraphs. With Google Lens built right in, the Moto Z3 Play's smart camera allows you to augment your world by recognizing objects so you can search and shop better, interact with text, and learn more about landmarks you visit. The smart camera adds Cinemagraphs for a fun and creative touch to your photos by freezing a moment in a video while keeping part of the shot animated - a unique combination of video and photo. And for that perfect selfie, all you have to do is select portrait mode and the Moto Z3 Play's upgraded 8MP front camera takes care of the rest. Motorola's modular technology transforms your Moto Z3 Play into a mobile experience. Print Polaroid photos straight from your phone in seconds, project a 70" screen wherever you are or tap a personal assistant for music, news, questions and more. And, because of Motorola's commitment to backward compatibility, all your favorite Moto Mods work with your new Moto Z3 Play. Customizing your smartphone to match your own wants and needs is more accessible thanks to Moto Z3 Play + Moto Mod bundles. Whether you're looking for more power - up to 40 hours of combined battery life when you attach a Moto Power Pack - or entertainment on the go, Moto Mod bundles have you covered. Moto Z3 Play comes with all the intuitive Moto Experiences, including Moto Display and Moto Actions. They let you easily access useful phone functionality at exactly the right time. Before you go to bed, night display automatically adjusts your screen to warmer tones to help you sleep. Need to snap a picture? Just twist your wrist to open the camera. Need extra light? Turn on the flashlight with a simple chop-chop motion. Take a screenshot using quick screenshot capture with an easy three finger gesture. Moto Z3 Play will be available in Brazil today starting at R$ 2,299, and will roll out globally starting this month. The new moto z3 play will be available this summer in the U.S. at Sprint and U.S. Cellular. The Moto Z3 Play will also be available universally unlocked at retailers including Best Buy, Walmart, Target, Fry's, B&H Photo, and a Prime Exclusive Phone on Amazon.com. At retail, the Moto Z3 Play will be bundled with a battery moto mod for $499. The new Moto Z3 Play will be available this summer in Canada at Videotron, Bell Mobility, Virgin Mobile, MTS, and SaskTel.